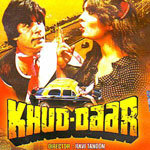 "Khuddar" is a 1982 hindi film which has Amitabh Bachchan, Parveen Babi, Vinod Mehra, Bindiya Goswami, Sanjeev Kumar, Tanuja, Mehmood, Prem Chopra, A K Hangal, Pinchoo Kapoor and Raza Murad in lead roles. We have 3 songs lyrics and 2 video songs of Khuddar. Rajesh Roshan has composed its music. Lata Mangeshkar and Kishore Kumar have sung these songs while Majrooh Sultanpuri has penned its lyrics.